Ultrasonic motors, which have superior characteristics like high torque at low speed, the absence of magnetic interference, and compactness in size, are good candidates for medical applications, automation, robotics, aerospace engineering and various other fields. Many different types of ultrasonic motors have been proposed up to date. The stator of an ultrasonic motor that is excited by piezoelectric elements in ultrasonic frequency range develops different kinds of vibrations depending on its structure. From the way of creating an elliptical motion on the stator, ultrasonic motors were classified into two major groups, such as standing wave and traveling wave types. Further classifications include mode-conversion, multi-mode and mode-rotation types of motors that are suitable for miniaturization and can be manufactured less costly. Ultrasonic motors are of great interest due to the flexibility of miniaturization in comparison with conventional electromagnetic motors whose efficiency decreases significantly. Especially in information systems and medical industry, compact size of these motors makes them find wider applications. Ultrasonic Motors are small size, a low speed, and high torque, and are excellent in a response and silence. Moreover, because they have high holding power at the time of un-applying an electric current, the moving part which does not use reduction gears can be built. of a motor by the influence of magnetic. And an ultrasonic motor does not generate magnetism during rotation.For this reason, the stable operation in strong magnetic field environments, such as near MRI and superconductivity experiment equipment, is possible. Now, Ultrasonic Motor is used for the following uses. 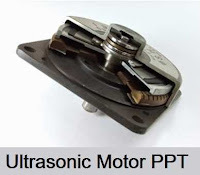 We have uploaded the Ultrasonic Motor PPT Report with illustrated images.If you want to download the Ultrasonic Motor PPT then simply click the link given below. There is also given the preview and link of Ultrasonic Motor PPT uploaded in YouTube. All the images used are copyright to the owners of the respective websites mentioned in the Ultrasonic Motor PPT reference slide.